Built to last through multiple babies in diapers, just like the cloth diapers youâ€™re spraying. Save time and money by sticking with cloth longer! Why is a Spray Pal so special? 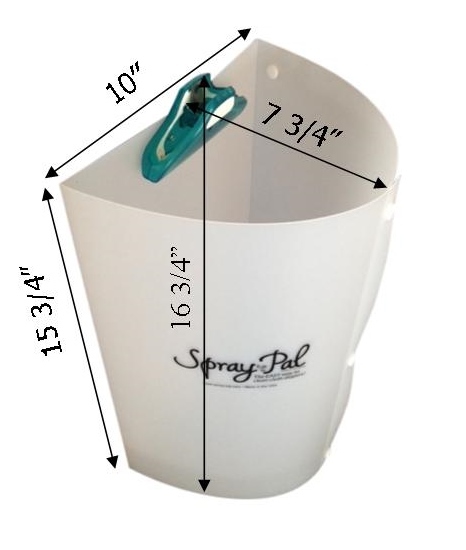 The Spray Pal was invented by a cloth diapering mom AND dad who collaborated to make it the most effective at stopping splatter and the most efficient for cleaning, storing, and shipping to customers. It is made in the USA, right here in California. A local shop does most of the production, but we still attach the clips right in our home garage. It is made from the highest quality polyethylene which is composed of 50% post consumer recycled plastic. It is BPA, PVC, and phthalate free. It is strong enough to allow you to bend the Spray Pal as much as you need to squeeze the excess water out. Speaking of water, we made sure to use only 100% aluminum materials in our clip and rivets. Sure it might cost a bit more, but this will guarantee that they wonâ€™t rust after years of use and exposure to water from the diaper sprayer. We went through many designs and prototypes before we came to the current product which meets our high standards for helping parents spray cloth diapers easily.